Don't have a green thumb or infinite patience, but still love the intricacy and grace of tiny bonsai trees? This kit is for you! Create four paper models while learning about the history and tradition of bonsai. 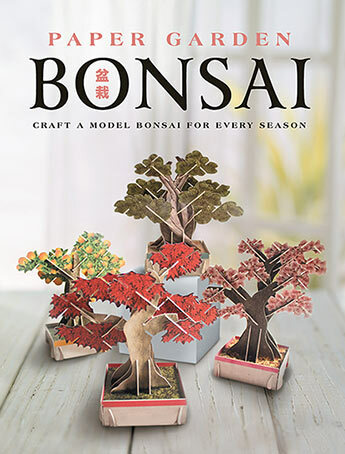 The fully illustrated instruction book guides you through the construction of each bonsai model - one for each of the four seasons. The models are fully illustrated, laser cut, heavy duty card stock. These minuscule masterpieces make a great addition to any office or home decor. Amy Spungens experience researching bonsai for Paper Garden Bonsai led her to a deep appreciation for the art of bonsai...and to the realization that she is too impatient to grow her own. She is therefore grateful to live in Highland Park, Illinois, near the Chicago Botanic Garden, so that she can enjoy its stellar bonsai collection.